Pleural effusions occur as a result of increased fluid formation and/or reduced fluid resorption. The precise pathophysiology of fluid accumulation varies according to underlying aetiologies. As the differential diagnosis for a unilateral pleural effusion is wide, a systematic approach to investigation is necessary. The aim is to establish a diagnosis swiftly while minimising unnecessary invasive investigations and facilitating treatment, avoiding the need for repeated therapeutic aspirations when possible. Since the 2003 guideline, several clinically relevant studies have been published, allowing new recommendations regarding image guidance of pleural procedures with clear benefits to patient comfort and safety, optimum pleural fluid sampling and processing and the particular value of thoracoscopic pleural biopsies. This guideline also includes a review of recent evidence for the use of new biomarkers including N-terminal pro-brain natriuretic peptide (NT-proBNP), mesothelin and surrogate markers of tuberculous pleuritis. The history and physical examination of a patient with a pleural effusion may guide the clinician as to whether the effusion is a transudate or an exudate. This critical distinction narrows the differential diagnosis and directs further investigation. Clinical assessment alone is often capable of identifying transudative effusions. Therefore, in an appropriate clinical setting such as left ventricular failure with a confirmatory chest x-ray, such effusions do not need to be sampled unless there are atypical features or they fail to respond to treatment. Approximately 75% of patients with pulmonary embolism and pleural effusion have a history of pleuritic pain. These effusions tend to occupy less than one-third of the hemithorax and the dyspnoea is often out of proportion to the size of the effusion.2 3 As tests on the pleural fluid are unhelpful in diagnosing pulmonary embolism, a high index of suspicion is required to avoid missing the diagnosis. The patient's drug history is also important. Although uncommon, a number of medications have been reported to cause exudative pleural effusions (box 1). Useful resources for more detailed information include the British National Formulary and the web site http://www.pneumotox.com/. An occupational history including details about known or suspected asbestos exposure and potential secondary exposure via parents or spouses should be documented. An algorithm for the iinvestigation of a unilateral pleural effusion is shown in figure 1. 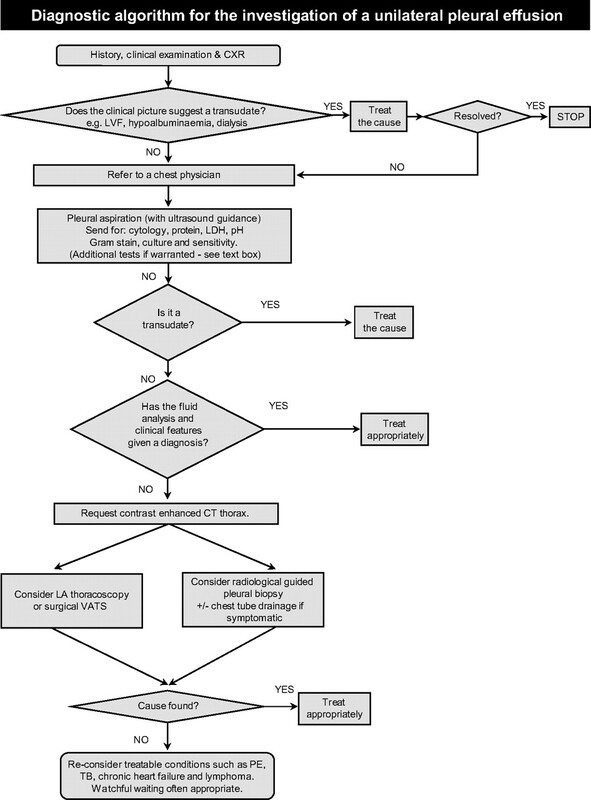 Diagnostic algorithm for the investigation of a unilateral pleural effusion. Chest x-ray showing a moderate left pleural effusion and subpulmonic effusion on the right (a). Note the lateral peaking of the right hemidiaphragm. Reproduced with permission from Professor David Milne, Auckland University. Clinical judgement with review of the chest x-ray was compared with ultrasonography in planning the diagnostic aspiration site in a prospective study including 255 clinician assessments of 67 patients.4 The sensitivity and specificity of clinical judgement compared with the gold standard of ultrasound was 76.6% and 60.3%, respectively. Ultrasound increased the number of accurate sites by 26%; 15% of clinically determined sites would have resulted in the puncture of liver, spleen or lung and, although there was increasing risk with small or loculated effusions, 60% of potential organ punctures occurred in radiologically large or moderate effusions. Ultrasound is superior to plain radiography in diagnosing and quantifying pleural effusions and distinguishes pleural fluid from thickening with high specificity, particularly when colour Doppler is employed.13–16 It is particularly useful in the diagnosis of small effusions or in recumbent patients (eg, ventilated and critically ill) due to the low sensitivity of plain radiography in these situations. The diagnostic role of thoracic ultrasound in the early investigation of pleural effusions extends beyond the identification and safe aspiration of fluid. Ultrasound features can distinguish malignant from benign effusions. Qureshi et al demonstrated 95% specificity for a malignant diagnosis, 95% for parietal pleural thickening >1 cm, 100% for visceral pleural thickening, 95% for diaphragmatic thickening >7 mm and 100% for diaphragmatic nodules as visualised on ultrasound examination.20 Overall sensitivity of ultrasound in the differentiation of malignant from benign effusions was 79% (95% CI 61% to 91%) and specificity of 100% (95% CI 82% to 100%), with specificity comparing favourably with CT scanning (89%). This is the primary means of evaluating pleural fluid and its findings are used to guide further investigation. Pleural ultrasound should be used at the bedside to select a pleural aspiration site with safety. Ultrasound increases the chances of successful aspiration and minimises the need for repeated attempts.21 Direct ultrasound-guided aspiration or ultrasound at the bedside immediately before the procedure is preferable to the ‘X marks the spot’ approach. A lateral site is preferred, provided that adequate fluid is demonstrated here on ultrasound as the risk of intercostal vessel trauma increases with more posterior or medial punctures (see figure 3). CT scan (A) before and (B) 2 days later after a pleural aspiration with inappropriate medial approach and intercostal artery puncture with resultant haemothorax requiring surgical intervention. Note the active bleeding indicated by the arrow. Patient consent and further technical details of pleural aspiration are covered in the guideline on pleural procedures. Table 1 shows sample collection guidance for specific pleural fluid tests. Table 2 summarises the appearance of pleural effusions due to specific causes. Fluid may appear serous, blood-tinged, frankly bloody or purulent. Centrifuging turbid or milky pleural fluid will distinguish between empyema and lipid effusions. If the supernatant is clear, the turbid fluid was due to cell debris and empyema is likely while, if it is still turbid, chylothorax or pseudochylothorax are likely.26 The unpleasant smell of anaerobic infection may guide antibiotic choices and the smell of ammonia suggests urinothorax. Pleural fluid LDH >2/3 the upper limits of laboratory normal value for serum LDH. Categorisation of pleural effusions into transudates and exudates is an important early step in narrowing the differential diagnosis and directing subsequent investigations and management (see boxes 3 and 4). A considerable number of other biochemical markers have been compared with Light's criteria but the latter, with a diagnostic accuracy of 93–96%, remains a robust method.31 32 This discriminatory accuracy is unlikely to be surpassed as the ‘gold standard’ for comparison in clinical diagnosis which itself carries an error rate. NT-proBNP is a sensitive marker of both systolic and diastolic cardiac failure. Levels in blood and pleural fluid correlate closely and measurement of both has been shown in several series to be effective in discriminating transudates associated with congestive heart failure from other transudative or exudative causes.36–39 The cut-off value of these studies, however, varied widely from 600 to 4000 pg/ml (with 1500 pg/ml being most commonly used), and most studies excluded patients with more than one possible aetiology for their effusion. NT-proBNP has been shown to correctly diagnose congestive heart failure as a cause of most effusions that have been misclassified as exudates by Light's criteria. Use of this test may therefore avoid repeated invasive investigations in patients where there is a strong clinical suspicion of cardiac failure.40–42 As results with pleural fluid and blood are comparable, applying the test to blood alone is sufficient (see evidence table A available on the BTS website at www.brit-thoracic.org.uk). Evidence for the use of measuring BNP (also known as C-terminal BNP, the active peptide from which NT-proBNP is cleaved) is relatively scarce to date. In clinical practice, the most important use for pleural fluid pH is aiding the decision to treat pleural infection with tube drainage. A meta-analysis of studies examining pleural pH and the need for chest tube drainage or surgery in patients with a parapneumonic effusion found that a pH <7.2 was the most specific discriminator of complicated pleural infection.54 This is covered in detail in the pleural infection guideline. The collection and analysis technique can have a clinically significant impact on pleural fluid pH results. A prospective study found that exposure of fluid to air in the syringe increased the measured pleural fluid pH by ≥0.05 in 71% of samples and inclusion of 0.2 ml local anaesthetic produced a mean reduction in pH of 0.15 (95% CI 0.13 to 0.18).56 Pleural fluid should therefore be collected and transported without exposure to atmospheric air and local anaesthetic avoided for diagnostic aspirations where the pH will be used to guide management. Pleural pH does not change significantly if processing is delayed for up to an hour at room temperature. An arterial blood gas analyser should be used.57 In routine clinical practice it is often difficult to adhere to these collection requirements and, when they cannot be achieved, overall clinical assessment may be preferable to reliance on a suboptimal pleural fluid pH result. When pleural fluid glucose is measured, the sample should be sent in a fluoride oxalate tube. Isoenzyme analysis can be useful but is not readily available in many laboratories. Elevation of salivary amylase suggests oesophageal rupture or malignancy.61 62 Pleural effusions associated with pancreatic disease usually contain pancreatic amylase.61 The incidence of pleural effusion with acute pancreatitis exceeds 50%. Patients with acute pancreatitis and a pleural effusion tend to have more severe disease and a higher likelihood of subsequently developing a pseudocyst than those without effusions.65 If oesophageal rupture is entertained as a differential diagnosis, urgent more specific investigation by contrast radiography or endoscopy is indicated. If malignancy is suspected, cytological examination of the pleural fluid is a quick and minimally invasive way to obtain a diagnosis. Series examining the diagnostic rate for malignancy of pleural cytology have reported a mean sensitivity of about 60% (range 40–87%).67–70 The yield from sending more than two specimens of pleural fluid taken on different occasions is low. One study found a yield of 65% from the first specimen, a further 27% from the second specimen and only 5% from the third.70 The diagnostic yield for malignancy depends on sample preparation, the experience of the cytologist and on tumour type. The diagnostic rate is higher for adenocarcinoma than for mesothelioma, squamous cell carcinoma, lymphoma and sarcoma. Swiderek et al found that submission of a 60 ml pleural fluid sample produced a significantly better sensitivity for the diagnosis of malignancy than 10 ml, but previous studies have shown that sending volumes >50 ml did not improve the diagnostic yield.23 24 The evidence for sending large volumes of pleural fluid is not strong enough to justify the increased risk of complications associated with the use of a venflon and three-way tap for initial diagnostic aspiration. As much fluid as possible should be sent for cytology from the available diagnostic sample (likely to be 20–40 ml) and, when the initial result is negative but malignancy is suspected, the sending of a higher volume sample following a second aspiration should be considered. If the initial aspiration is both therapeutic and diagnostic, ≥60 ml should be sent for cytological examination. Pleural fluid should be sent in a plain container which allows the cellular portion to separate, forming a fibrinous ‘clot’ which may enmesh malignant cells. These can then undergo histological examination and are reported with the fluid cytology. Some departments, however, prefer the use of bottles containing sodium citrate to keep the cells in free suspension. No other anticoagulants or preservatives should be used as they may interfere with cellular adherence to slides and immunocytochemistry. Table 3 provides an interpretation of common pleural fluid cytology reports seen in clinical practice. Once malignancy has been confirmed morphologically, immunocytochemistry should be used to differentiate between different malignant cell types. This can be performed on a cytology sample, cell block or a clot.72 There is particularly extensive morphological overlap between malignant mesothelioma and metastatic adenocarcinoma cells and immunocytochemistry can assist in their differentiation. However, whenever possible, pleural tissue should be obtained to confirm a diagnosis of malignant mesothelioma. Mesothelin, however, has been shown to have more promising diagnostic characteristics (see evidence table B available on the BTS website at www.brit-thoracic.org.uk). A positive serum or pleural fluid mesothelin level is highly suggestive of pleural malignancy and might be used to expedite a tissue diagnosis, but a negative result cannot be considered reassuring. Pleural fluid mesothelin has been shown to have additional value beyond pleural fluid cytology in the diagnosis of mesothelioma and might be used for its positive predictive value to clarify indeterminate cytology results.80 Although mesothelin has a greater diagnostic accuracy than other tumour markers, its real clinical utility in the investigation of an undiagnosed pleural effusion, particularly in combination with routine clinical and radiological assessment, warrants further study before its use can be routinely recommended. 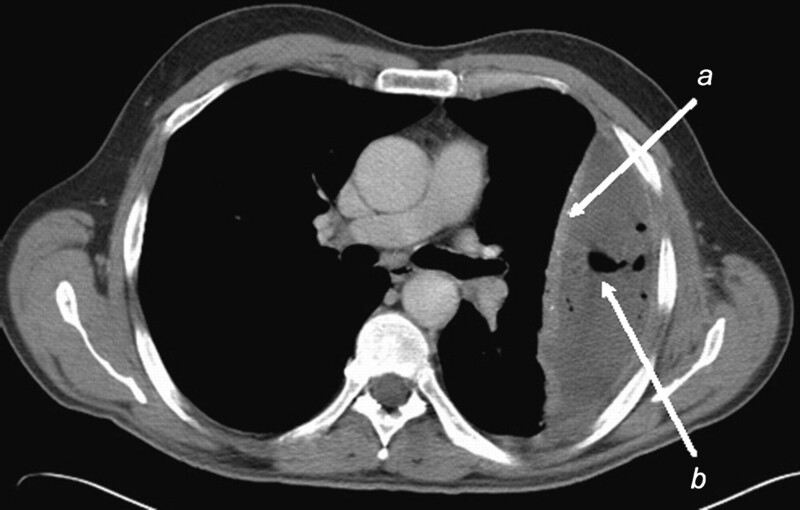 CT scan of left empyema with pleural enhancement (a) and suspended air bubbles (b). CT is particularly helpful in the diagnosis of empyema when the pleura enhances intensely around the fluid which usually forms a lenticular opacity (figure 4).83 84 CT also distinguishes empyemas from lung abcesses. There are features of contrast-enhanced thoracic CT scanning which can help differentiate between benign and malignant disease (figure 5). In a study of 74 patients, 39 of whom had malignant disease, Leung et al showed that malignant disease is favoured by nodular pleural thickening, mediastinal pleural thickening, parietal pleural thickening >1 cm and circumferential pleural thickening. These features had specificities of 94%, 94%, 88% and 100%, respectively, and sensitivities of 51%, 36%, 56% and 41%.85 The accuracy of the criteria of Leung et al for the detection of pleural malignancy has been confirmed in several prospective studies.82 86 Differentiation of pleural mesothelioma from metastatic pleural malignancy is very difficult as the conditions share many CT features. Right malignant pleural effusion with enhancing nodular pleural thickening (a) extending over the mediastinum (b). A review of Abrams pleural biopsy yield from 2893 examinations showed a diagnostic rate of only 57% for malignancy.96 The yield over pleural fluid cytology alone is increased by only 7–27% for malignancy.68 69 Complications of Abrams pleural biopsy include site pain (1–15%), pneumothorax (3–15%), vasovagal reaction (1–5%), haemothorax (<2%), site haematoma (<1%), transient fever (<1%) and, very rarely, death secondary to haemorrhage. The contrast-enhanced thoracic CT scan of a patient with a pleural effusion will often show a focal area of abnormal pleura. An image-guided cutting needle biopsy allows that focal area of abnormality to be biopsied. It has a higher yield than that of blind pleural biopsy in the diagnosis of malignancy. This technique is particularly useful in patients who are unsuitable for thoracoscopy. In a prospective trial comparing local anaesthetic thoracoscopy with Abrams biopsy in an area with a high prevalence of TB,100 thoracoscopy was found to have a combined culture/histology sensitivity of 100% compared with 79% for Abrams pleural biopsy. The technique with the highest diagnostic rate for tuberculous pleuritis on the basis of published evidence is therefore local anaesthetic thoracoscopy. However, since blind pleural biopsy has reasonably high sensitivity and is likely to be more cost effective as an initial diagnostic procedure, it will often be the procedure of first choice in resource-poor areas with a high incidence of TB. Blind pleural biopsy cannot be justified for the diagnosis of TB where the incidence is not high enough to maintain operator experience (see evidence table C available on the BTS website at www.brit-thoracic.org.uk). In patients with a symptomatic exudative pleural effusion where a diagnostic pleural aspiration is negative or inconclusive, thoracoscopy is suggested as the next choice investigation since the procedure will be relatively uncomplicated and pleurodesis is likely to be indicated. Local anaesthetic thoracoscopy can be performed by physicians or surgeons and is a safe and well tolerated procedure. Major complications (eg, empyema, haemorrhage and pneumonia) occur in only 2.3% (95% CI 1.9% to 2.8%) and death is rare at 0.40% (95% CI 0.2% to 0.7%). It has a diagnostic sensitivity for malignant pleural disease of 92.6% (95% CI 91.0% to 93.9%).101–121 It also has a higher diagnostic yield than blind pleural biopsy for tuberculous pleuritis. Talc poudrage can be administered at the end of the procedure which achieves a successful pleurodesis in 80–90% (see BTS guideline on thoracoscopy for further detail. One advantage of VATS over local anaesthetic thoracoscopy is that the surgical operator is able to proceed to other thoracic surgical options, if appropriate, at the time of the procedure. In particular, a judgement can be made as to whether the lung is trapped or free to expand. In trapped lung syndrome, pleurodesis is likely to be less effective so an indwelling pleural catheter can be placed at the time of VATS (see BTS guideline on thoracoscopy. Bronchoscopy has a limited role in the investigation of patients with an undiagnosed pleural effusion as its diagnostic yield is very low.123–126 It should be reserved for patients whose radiology suggests the presence of a mass or loss of volume or when there is a history of haemoptysis, possible aspiration of a foreign body or a trapped lung with a suspicion of a proximal lung mass. If bronchoscopy is deemed necessary, it should be performed after pleural drainage in order to perform adequate examination without extrinsic airway compression by pleural fluid. Tuberculous pleuritis is a treatable cause of a lymphocytic pleural effusion. It is desirable to exclude the diagnosis in patients with lymphocytic effusions, avoiding inappropriate and side effect-prone empirical antituberculous therapy. In patients who are unfit for invasive investigations, pleural fluid or blood biomarkers of infection can be useful. Adenosine deaminase (ADA) is an enzyme present in lymphocytes, and its level in pleural fluid is significantly raised in most tuberculous pleural effusions. A meta-analysis of 63 studies on the diagnostic use of ADA confirmed a sensitivity of 92%, specificity 90% and positive and negative likelihood ratios of 9.0 and 0.10, respectively.128 Raised ADA levels can also be seen in empyema, rheumatoid pleurisy and, occasionally, in malignancy. Restricting the use of ADA to lymphocytic effusions or measurement of isoenzyme ADA-2 can reduce the false positives significantly.129 ADA is very cheap and quick to perform and remains stable when stored at 4°C for up to 28 days.130 It is useful in patients with HIV or those immunosuppressed (eg, renal transplant). In countries with a low prevalence of TB, ADA is a useful ‘rule out’ test. In well-resourced healthcare settings, the greatest chance of obtaining mycobacterial culture and sensitivities should be pursued via thoracoscopic pleural biopsies. However, a large review of 7549 cases of tuberculous pleuritis by the Center for Disease Control showed that drug resistance patterns of pleural TB in the USA broadly reflected those of pulmonary TB in the same region.135 If mycobacterial culture and sensitivities are not achieved, the treatment regime should reflect that of the local resistance patterns. Rheumatoid arthritis and systemic lupus erythematosus (SLE) are the most common connective tissue diseases to involve the pleura. Pleural effusions occur in connective tissue disease due to primary autoimmune pleuritis or secondary to renal, cardiac, thromboembolic disease or drug therapy. No test definitively positively distinguishes SLE pleuritis from other causes of exudative effusions. Biochemical features are not distinctive or consistent.144 145 Elevated pleural fluid antinuclear antibodies (ANA) and an increased pleural fluid to serum ANA ratio is suggestive of SLE pleuritis, but elevation is also sometimes seen in malignant effusions.146 Porcel et al measured pleural fluid ANA titres in 266 patients with pleural effusions of established cause including 15 with SLE pleuritis. They demonstrated a sensitivity of 100% (95% CI 97% to 100%) and a specificity of 94% (95% CI 91% to 97%) for the pleural fluid test but, consistent with previous reports, the results were identical when testing serum.147 There is no additional value in measuring pleural fluid ANA above the serum test. Recent series applying Light's criteria have found that pleural effusions associated with pulmonary embolism are always exudates.3 149 Fluid characteristics, however, are non-specific and unhelpful in making the diagnosis which should be pursued radiologically, given a high index of clinical suspicion or in the context of an effusion that remains undiagnosed after standard baseline investigations. If the pleural fluid appears milky, chylothorax and pseudochylothorax must be considered. Occasionally an empyema can be sufficiently turbid to be confused with chyle. They can be distinguished by bench centrifugation which leaves a clear supernatant in empyema while chylous effusion remains milky. It should be noted that, in starved patients, chyle may not appear milky. True chylous effusions (chylothorax) result from disruption of the thoracic duct or its tributaries such that chyle is present in the pleural space. Unlike other exudative effusions, the diagnosis of chylothorax or its underlying cause cannot usually be established from thoracoscopy or pleural biopsies. In non-surgical cases, a CT scan of the thorax to exclude mediastinal pathology (especially lymphoma) is mandatory. The site of leak may be demonstrated by lymphangiography. Chylothorax can be a result of transdiaphragmatic migration of chylous ascites, which can be secondary to hepatic cirrhosis. In these cases, the pleural effusion is often a transudate. Benign asbestos pleural effusions are commonly diagnosed in the first two decades after asbestos exposure. The prevalence is dose-related with a shorter latency period than other asbestos-related disorders.155 The effusion is usually small and asymptomatic, often with pleural fluid which is haemorrhagic.156 157 There is a propensity for the effusion to resolve within 6 months, leaving behind residual diffuse pleural thickening.156 157 As there are no definitive tests, the diagnosis can only be made with certainty after a prolonged period of follow-up and consideration should be given to early thoracoscopy with pleural biopsy in any patient with a pleural effusion and a history of asbestos exposure, particularly in the presence of chest pain. Table 5 summarises clinical and pleural fluid characteristics of other important causes of unilateral pleural effusions. In patients not fit enough for thoracoscopy, it is sensible to reconsider diagnoses with a specific treatment (eg, TB, pulmonary embolism, lymphoma and chronic heart failure). A considerable number of undiagnosed pleural effusions in this category are due to a malignant process. Watchful waiting may be the appropriate management in this setting.
. Pleural fluid analysis. In: Light RW, Lee YCG, eds. Textbook of pleural diseases. 2nd edn. London: Arnold Press, 2008:209–26. (4).
. Pleural effusion in patients with pulmonary embolism. Respirology 2008;13:832–6. (3).
. Analysis of pleural effusions in acute pulmonary embolism: radiological and pleural fluid data from 230 patients. Respirology 2007;12:234–9. (3).
. Pleural fluid volume estimation: a chest radiograph prediction rule. Acad Radiol 1996;3:103–9. (2+).
. Detection of pleural effusions on supine chest radiographs. AJR Am J Roentgenol 1987;148:681–3. (2+).
. Imaging of diseases of the chest. 3rd edn, New York: Mosby, 2001. (4).
. Real-time sonography of pleural opacities. AJR Am J Roentgenol 1981;136:297–301. (2–).
. Value of chest ultrasonography versus decubitus roentgenology for thoracentesis. Am Rev Respir Dis 1986;133:1124–6. (2+).
. Sonographic guidance in diagnostic and therapeutic interventions in the pleural space. AJR Am J Roentgenol 1987;149:1–5. (3).
. Sonographically guided thoracentesis and rate of pneumothorax. J Clin Ultrasound 2005;33:442–6. (3).
. Complications associated with thoracentesis. A prospective randomized study comparing three different methods. Arch Intern Med 1990;150:873–7. (1+).
. Factors affecting the development of pneumothorax associated with thoracentesis. AJR Am J Roentgenol 1990;156:917–20. (3).
. Ultrsound of the pleura: an assessment of its clinical value. Clin Radiol 1981;32:289–90. (2+).
. Image comparison of real-time gray-scale ultrasound and colour Doppler ultrasound for use in diagnosis of minimal pleural effusion. Am J Respir Crit Care Med 1994;150:510–14. (2+).
. Usefulness of ultrasonography in predicting pleural effusions >500 ml in patients receiving mechanical ventilation. Chest 2005;127:224–32. (2+).
. Quantification of pleural effusions: sonography versus radiography. Radiology 1994;191:681–4. (2++).
. Sonography of malignant pleural effusion. Eur Radiol 1997;7:1195–8. (3).
. Value of sonography in determining the nature of pleural effusion: analysis of 320 cases. AJR Am J Roentgenol 1992;159:29–33. (2++).
. Thoracic ultrasound in the diagnosis of malignant pleural effusion. Thorax 2009;64:139–43. (2++).
. Accuracy of pleural puncture sites. A prospective comparison of clinical examination with ultrasound. Chest 2003;123:436–41. (2+).
. Prospective clinical and microbiological study of pleural effusions. Eur J Clin Microbiol Infect Dis 1999;18:237–41. (2+).
. A prospective study of the volume of pleural fluid required for accurate diagnosis of malignant pleural effusion. Chest 2009;135:999–1001. (2++).
. Prospective study to determine the volume of pleural fluid required to diagnose malignancy. Chest 2010;137:68–73. (2++).
. Diagnostic effects of prolonged storage on fresh effusion samples. Diagn Cytopathol 2007;35:7–11. (2+).
. Pleural fluid analysis: narrowing the differential diagnosis. Semin Respir Med 1987;9:22–9. (4).
. Clinical implications of appearance of pleural fluid at thoracentesis. Chest 2004;125:156–9. (3).
. Cells in pleural fluid. Their value in differential diagnosis. Arch Intern Med 1973;132:854–60. (3).
. Spontaneous hemothorax. Chest 2008;134:1056–65. (4).
. Pleural effusions: the diagnostic separation of transudates and exudates. Ann Intern Med 1972;77:507–13. (2++).
. Diagnostic value of tests that discriminate between exudative and transudative pleural effusions. Chest 1997;111:970–80. (1+).
. Is it meaningful to use biochemical parameters to discriminate between transudative and exudative pleural effusions? Chest 2002;122:1524–9. (2++).
. Influence of diuretics on the concentration of proteins and other components of pleural transudates in patients with heart failure. Am J Med 2001;110:681–6. (3).
. The evaluation of pleural effusions in patients with heart failure. Am J Med 2001;111:375–8. (3).
. Bayesian analysis using continuous likelihood ratios for identifying pleural exudates. Respir Med 2006;100:1960–5. (2−).
. Diagnostic value of pleural fluid N-terminal pro-brain natriuretic peptide levels in patients with cardiovascular diseases. Respirology 2008;13,53–7. (2−).
. High diagnostic accuracy of NT-proBNP for cardiac origin of pleural effusions. Eur Respir J 2006;28:144–150. (2++).
. Comparing serum and pleural fluid pro-brain natriuretic peptide (NT- proBNP) levels with pleural-to-serum albumin gradient for the identification of cardiac effusions misclassified by Light's criteria. Respirology 2007;12:654–9. (2++).
. Plasma B-type Natriuretic peptide in patients with pleural effusions. Chest 2005;128:1003–9. (2++).
. NT-brain natriuretic peptide levels in pleural fluid distinguish between pleural transudates and exudates. Eur J Heart Fail 2004;6:753–6. (2++).
. Measurement of Pro-Brain Natriuretic peptide in pleural fluid for the diagnosis of pleural effusions due to heart failure. Am J Med 2004;116:117–20. (2−).
. Clinical utility of pleural fluid NT-pro Brain Natriuretic peptide (NT-proBNP) in patients with pleural effusions. Intern Med 2008;47:1669–74. (2++).
. Diagnostic value of total and differential leukocyte counts in pleural effusions. Acta Med Scand 1981;210:129–35. (3).
. Management of undiagnosed persistent pleural effusions. Clin Chest Med 1998;19:407–17. (4).
. Pleural diseases, 3rd edn. Baltimore: Williams and Wilkins, 1995. (3).
. Clinicopathologic significance of eosinophilic pleural effusions in a population with a high prevalence of tuberculosis and cancer. Acta Cytol 2007;51:773–81. (3).
. Diagnostic utility of pleural fluid eosinophilia. Am J Med 1984;77:915–20. (3).
. Eosinophilic pleural effusion: a review of 36 cases. Respiration 1985;48:73–6. (3).
. Diagnostic utility of eosinophils in the pleural fluid. Eur Respir J 1999;15:166–9. (3).
. The glucose-pH relationship in parapneumonic effusions. Arch Intern Med 1978;138:1378–80. (3).
. Pleural fluid pH in malignant effusions. Diagnostic, prognostic, and therapeutic implications. Ann Intern Med 1988;108:345–9. (2++).
. Pleural fluid pH as a predictor of survival for patients with malignant pleural effusions. Chest 2000;117:79–86. (1+).
. Clinically important factors influencing the diagnostic measurement of pleural fluid pH and glucose. Am J Respir Crit Care Med 2008;178:483–90. (2++).
. Is pH paper an acceptable low cost alternative to the blood gas analyser for determining pleural fluid pH? Chest 1997;112:1291–92. (2+).
. Glucose and amylase in pleural effusions. JAMA 1973;225:257–60. (3).
. Pathogenesis and clinical features of diseases associated with low pleural fluid glucose. In: Chretien J, Bignon J, Hirsch A, eds. The pleural in health and disease. New York: Marcel Dekker, 1985:267–85. (4).
. The pleura. Am Rev Respir Dis 1988;138:184–234. (4).
. A prospective study of amylase-rich pleural effusions with special reference to amylase isoenzyme analysis. Chest 1992;102:1455–9. (3).
. Origin of pleural fluid amylase in oesophageal rupture. Ann Intern Med 1972;76:985–6. (4).
. High amylase levels in neoplasm related pleural effusion. Ann Intern Med 1989;110:567–9. (4).
. Routine measurement of pleural fluid amylase is not indicated. Arch Intern Med 2001;161:228–32. (3).
. Pleural effusions: a new negative prognostic parameter for acute pancreatitis. Am J Gastroenterol 1994;89:1848–51. (3).
. Recurrent left pleural effusion in a 44-year-old woman with a history of alcohol abuse. Chest 1996;110:547–49. (3).
. Efficacy of pleural needle biopsy and pleural fluid cytopathology in the diagnosis of malignant neoplasm involving the pleura. Chest 1975;67:536–9. (4).
. Diagnostic efficacy of pleural biopsy as compared with that of pleural fluid examination. Mod Pathol 1991;4:320–4. (2−).
. Comparison of needle biopsy with cytologic analysis for the evaluation of pleural effusion: analysis of 414 cases. Mayo Clin Proc 1985;60:158–64. (2−).
. The value of multiple fluid specimens in the cytological diqgnosis of malignancy. Mod Pathol 1994;7:665–8. (3).
. Cytology of serous effusions. An investigation into the usefulness of cell blocks versus smears. Am J Clin Pathol 1978;70:855–60. (3).
. The BSCC code of practice: exfoliative cytolopathology (excluding gynaecological cytopathology). Cytopathology 2009;20:211–33. (4).
. Tissue pathways for exfoliative cytology and fine needle aspiration cytology. London: Royal College of Pathologists, 2009. (4).
. Use of a panel of tumour markers (carcinoembryonic antigen, cancer antigen 125, carbohydrate antigen 15-3 and cytokeratin 19 fragments) in pleural fluid for the differential diagnosis of benign and malignant effusions. Chest 2004;126:1757–63. (2+).
. Soluble mesothelin-related peptides in the diagnosis of malignant pleural mesothelioma. Am J Respir Crit Care Med 2006;173:1155–60. (2+).
. Soluble mesothelin in effusions: a useful tool for the diagnosis of malignant mesothelioma. Thorax 2007;62:569–76. (2++).
. Combined CA125 and mesothelin levels for the diagnosis of malignant mesothelioma. Chest 2007;132:1239–46. (2+).
. Clinical significance of serum mesothelin in patients with mesothelioma and lung cancer. Clin Cancer Res 2007;13:5076–81. (2+).
. Mesothelin-family proteins and diagnosis of mesothelioma. Lancet 2003;362:1612–16. (2+).
. The clinical impact and reliability of pleural fluid mesothelin in undiagnosed pleural effusions. Am J Respir Crit Care Med 2009;180:437–44. (2+).
. Detection and quantitation of serum mesothelin, a tumour marker for patients with mesothelioma and ovarian cancer. Clin Cancer Res 2006;12:447–53. 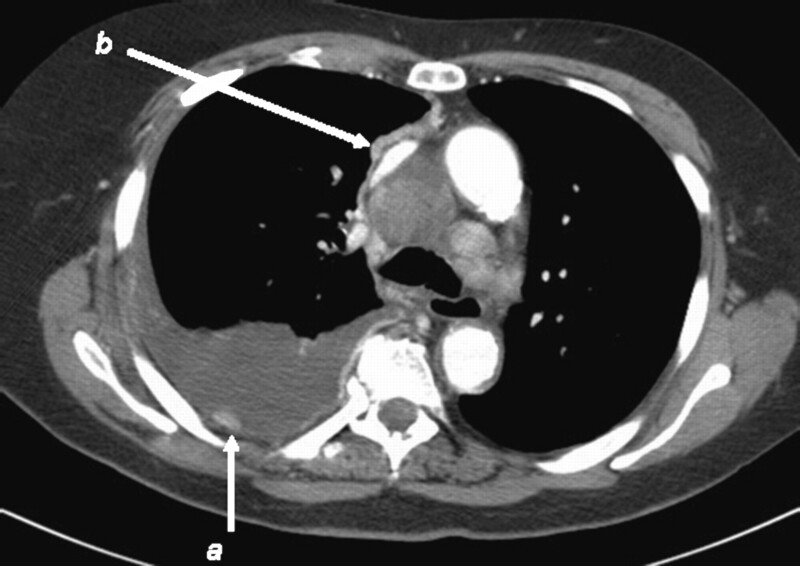 (2−).
. Thoracic computed tomography in patients with suspected malignant pleural effusions. Clin Radiol 2001;56:193–6. (2++).
. Imaging of the pleura: sonography, CT, and MR imaging. AJR Am J Roentgenol 1991;156:1145–53. (4).
. Parietal pleural changes in empyema: appearances on CT. Radiology 1990;175:145–50. (3).
. CT in differential diagnosis of diffuse pleural disease. AJR Am J Roentgenol 1989;154:487–92. (2−).
. Diffuse pleural thickening: percutaneous CT-guided cutting needle biopsy. Radiology 1995;194:867–70. (2+).
. Usefulness of MR signal intensity in distinguishing benign from malignant pleural disease. AJR Am J Roentgenol 1995;166:963–8. (2+).
. Evaluation of pleural disease using MR and CT. Acta Radiol 2001;42:502–7. (2+).
. Dynamic contrast enhanced MRI of malignant pleural mesothelioma: a feasibility study of non-invasive assessment, therapeutic follow-up, and possible predictor of improved outcome. Chest 2006;129;1570–6. (2+).
. Evaluation of pleural disease with 18-Fluorodeoxyglucose positron emission tomography imaging. Chest 2004;125:489–93. (2++).
. Evaluation of pleural disease with FDG-PET imaging: preliminary report. Thorax 1997;52:187–9. (2++).
. Fluorodeoxyglucose positron emission tomography and CT after talc pleurodesis. Chest 2004;125:2356–60. (3).
. Therapy response evauation in malignant pleural mesothelioma with integrated PET-CT imaging. Lung Cancer 2005;49(Suppl 1):S33–5. (2+).
. Early response evaluation in malignant pleural mesothelioma by positron emission tomography with 18F-fluorodeoxyglucose. J Clin Oncol 2006;24:4587–93. (2++).
. Early prediction of response to chemotherapy and survival in malignant pleural mesothelioma using a novel semiautomated 3-dimensional volume-based analysis of serial 18F-FDG PET scans. J Nucl Med 2007;48:1449–58. (2++).
. Invasive procedures in the diagnosis of pleural disease. Semin Respir Med 1987;9:30–60. (2+).
. Percutaneous image-guided cutting needle biopsy of the pleura in the diagnosis of malignant mesothelioma. Chest 2001;120:1798–802. (2−).
. Percutaneous image-guided cutting-needle biopsy of the pleura in the presence of a suspected malignant effusion. Radiology 2001;219:510–14. (2+).
. Standard pleural biopsy versus CT guided cutting-needle biopsy for the diagnosis of malignant disease in pleural effusions: a randomised controlled trial. Lancet 2003;361:1326–31. (1++).
. Diagnostic tools in tuberculous pleurisy: a direct comparative study. Eur Respir J 2003;22:589–91. (2++).
. Diagnostic value of medical thoracoscopy in pleural disease: a 6-year retrospective study. Chest 2002;121:1677–83. (2−).
. Thoracoscopy in pleural malignant mesothelioma: a prospective study of 188 consecutive patients. Part 1: Diagnosis. Cancer 1993;72:389–93.(2+).
. Medical thoracoscopy, results and complications in 146 patients: a retrospective study. Respir Med 1998;92:228–32. (2−).
. Thoracoscopy for the diagnosis of pleural disease. Ann Intern Med 1991;114:271–6. (2+).
. Thoracoscopy: assessment of a physician service and comparison of a flexible bronchoscope used as a thoracoscope with a rigid thoracoscope. Thorax 1988;43:327–32. (3).
. Medical thoracoscopy: wxperience with 212 patients. J BUON 2000;5:169–72. (2−).
. Frozen section of pleural biopsies at medical thoracoscopy assists in correctly identifying benign disease. Respirology 2005;10:636–42. (3).
. The Portsmouth thoracoscopy experience, an evaluation of service by retrospective case note analysis. Respir Med 2007;101:1021–5. (3).
. Extended thoracoscopy: a biopsy method to be used in case of pleural adhesions. Eur Respir J 1992;5:763–6. (3).
. Prospective evaluation of flex-rigid pleuroscopy for indeterminate pleural effusion: accuracy, safety and outcome. Respirology 2007;12:881–6. (2−).
. The role of ultrasound assisted thoracoscopy in the diagnosis of pleural disease. Clinical experience in 687 cases. Eur J Cardiothorac Surg 1993;7:19–22. (3).
. Investigation of pleural effusion: an evaluation of the new Olympus LTF semiflexible thoracofiberscope and comparison with Abram's needle biopsy. Chest 1998;114:150–3. (2−).
. The autoclavable semirigid thoracoscope: the way forward in pleural disease? Eur Respir J 2007;29:571–4. (2−).
. Thoracoscopy. A safe, accurate diagnostic procedure using the rigid thoracoscope and local anesthesia. Chest 1979;75:45–50. (2−).
. Diagnostic value of thoracoscopic pleural biopsy for pleurisy under local anaesthesia. Aust NZ J Surg 2006;76:722–4. (2−).
. Medical thoracoscopy: hormone receptor content in pleural metastases due to breast cancer. Eur Respir J 2004;24:728–30. (3).
. Medical thoracoscopy in an Australian regional hospital. Intern Med J 2007;37:267–9. (2−).
. Video-assisted thoracoscopy is feasible under local anesthesia. Diagn Ther Endosc 1998;4:177–82. (3).
. Minithoracoscopy: a less invasive approach to thoracoscopy. Chest 2003;124:1975–7. (3).
. Medical thoracoscopy in the diagnosis of unexplained pleural effusion. Respirology 1998;3:77–80. (2−).
. The long term follow up of exudative pleural effusion after nondiagnostic thoracoscopy. J Bronchol 2004;11:169–74. (2−).
. Complications of thoracoscopy. Poumon Coeur 1981;37:25–8. (3).
. The role of fibreoptic bronchoscopy in the investigation of pleural effusion. Postgrad Med J 1988;64:581–2. (3).
. Investigation of pleural effusion: the role of bronchoscopy. Aust NZ J Med 1992;22:41–3. (3).
. Fiberoptic bronchoscopy and pleural effusion of unknown origin. Chest 1986;90:516–19. (3).
. The role of fiberoptic bronchoscopy in evaluating the causes of pleural effusions. Arch Intern Med 1989;149:855–7. (2+).
. Cytology and bacteriologic analysis of fluid and pleural biopsy specimens with Cope's needle. Study of 414 patients. Arch Intern Med 1990;150:1190–4. (2+).
. Diagnostic accuracy of adenosine deaminase in tuberculous pleurisy: a meta-analysis. Respir Med 2008;102:744–54. (1+).
. The diagnostic utility of adenosine deaminase isoenzymes in tuberculous pleural effusions. Int J Tuberc Lung Dis 2009;13:214–20. (2−).
. Influence of storage time and temperature on pleural fluid adenosine deaminase determination. Respirology 2006;11:488–92. (3).
. Adenosine deaminase and interferon gamma measurements for the diagnosis of tuberculous pleurisy: a meta-analysis. Int J Tuberc Lung Dis 2003;7:777–86. (1+).
. Use of a T-cell interferon-gamma release assay for the diagnosis of tuberculous pleurisy. Eur Respir J 2007;30:1173–9. (2++).
. Diagnosis of active tuberculous serositis by antigen-specific interferon-gamma response of cavity fluid cells. Clin Infect Dis 2007;45:1559–67. (2++).
. Novel tests for diagnosing tuberculous pleural effusion: what works and what does not? Eur Respir J 2008;31:1098–106. (4).
. Pleural tuberculosis in the United States: incidence and drug resistance. Chest 2007;131:1125–32. (3).
. The pleural and pulmonary complications of rheumatoid arthritis. Ann Intern Med 1959;51:1179–203. (4).
. Rheumatoid pleural effusion. Semin Arthritis Rheum 2006;35:368–78. (4).
. Cholesterol pleural effusion in rheumatoid lung disease. Thorax 1966;21:577–82. (3, 4).
. Rheumatoid pleurisy with effusion. Arch Intern Med 1971;128:764–8. (3).
. Pleural fluid complement, complement conversion, and immune complexes in immunologic and non immunologic diseases. J Lab Clin Med 1977;90:971–80. (3).
. Chemical and immunological features of pleural effusions: comparison between rheumatoid arthritis and other diseases. Thorax 1982;37:354–61. (2+).
. Immune complexes and other laboratory features of pleural effusions. Ann Intern Med 1980;92:748–52. (3).
. Pulmonary involvement in the collagen vascular diseases. Am Rev Respir Dis 1979;119:471–85. (4).
. Lupus pleuritis. Clinical features and pleural fluid characteristics with special reference to pleural fluid antinuclear antibodies. Chest 1983;84:714–18. (4).
. Pleural fluid glucose in systemic lupus erythematosus. Mayo Clin Proc 1970;45:409–12. (3).
. Serial antinuclear antibodies titre in pleural and pericardial fluid. Eur Respir J 2000;15:1106–10. (2+).
. Antinuclear antibody testing in pleural fluid for the diagnosis of lupus pleuritis. Lupus 2007;16:25–7. (2−).
. Clinical, laboratory, roentgenographic, and electrocardiographic findings in patients with acute pulmonary embolism and no pre-existing cardiac or pulmonary disease. Chest 1991;100:598–603. (3).
. Biochemical and cytological characteristics of pleural effusions secondary to pulmonary embolism. Chest 2002;121:465–9. (3).
. Etiology of chylothorax in 203 patients. Mayo Clin Proc 2005;80:867–70. (3).
. Chyliform(cholesterol) pleural effusion. Chest 1985;88:426–8. (4).
. Chylothorax and pseudochylothorax. Eur Respir J 1997;10:1150–6. (4).
. Pseudochylothorax without pleural thickening—time to reconsider pathogenesis? Chest 2009;136:1144–7. (3).
. The lipoprotein profile of chylous and non-chylous pleural effusions. Mayo Clin Proc 1980;55:700–4. (3).
. Prevalence and incidence of benign asbestos pleural effusion in a working population. JAMA 1982;247:617–22. (3).
. Benign asbestos pleural effusion: 73 exudates in 60 patients. Eur J Respir Dis 1987;71:113–21. (3).
. Benign asbestos pleural effusion: diagnosis and course. Thorax 1981;36:896–900. (4).
. Pleural effusions following cardiac injury and coronary artery bypass graft surgery. Semin Respir Crit Care Med 2001;22:657–64. (4).
. Prevalence and clinical course of pleural effusions at 30 days after coronary artery and cardiac surgery. Am J Respir Crit Care Med 2002;166:1567–71. (3).
. Urinothorax: case report and review of the literature with emphasis on biochemical diagnosis. Respiration 2004;71:533–6. (4).
. Review of clinical course and treatment of ovarian hyperstimulation syndrome (OHSS). Hum Reprod Update 2003;9:77–96. (3).
. Analysis of pleural effusions using flow cytometry. Respiration 1996;63:17–24. (2+).
. Does ‘idiopathic pleuritis’ exist? Natural history of non-specific pleuritis diagnosed after thoracoscopy. Respiration 2005;72:74–8. (3).